“Any sufficiently advanced technology is indistinguishable from magic,” said British inventor and science fiction writer Arthur C. Clarke. For many of today’s marketing and business executives, business analytics must seem like magic, giving them more power to delve deeply into every aspect of their organizations. Once the province of only enterprise-level businesses, today’s analytics tools are scalable and user-friendly, especially as the technology continues to evolve. New and exciting changes are still on the horizon. Below are some examples of the analytics technologies and trends of the future. Watson, IBM’s supercomputer, may be one of the most amazing technologies ever developed. The device unites artificial intelligence, natural language and cognitive processing abilities, and unheard-of volumes of data into a supercomputing tool with nearly limitless applications. 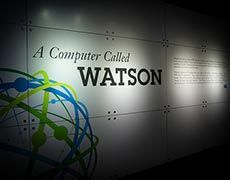 In 2014, IBM announced it was contributing more than $1 billion to form the Watson Group and to develop three new services based on the computer’s cognitive intelligence: Discovery Advisor, a research tool; Analytics; and Explorer, a platform for sharing big data insights across an enterprise. The Internet of Things (IoT) is an increasingly important aspect of life in and outside of the workplace, and analytics will only naturally develop and evolve to handle the massive amounts of data generated by the growth of the IoT. The Internet of Things can simply be described as a network and relationship of connected products, including cell phones, watches, household items and even people. For business executives, new IoT analytics can offer insight into operational risks, productivity enhancements and improved security protocols. On the consumer side, data generated by wearables, smart appliances and home health sensors can be collected and analyzed for improved product development and hyper-personalized marketing strategies. Chris Curran, PricewaterhouseCoopers chief technologist for its U.S. advisory group, said that big data lakes will revolutionize traditional database theory. In the past, database theory dictated designing the data set before inputting real data. With big data lakes, he said, scientists “take these data sources and dump them all into a big Hadoop repository, and [they] won’t try to design a data model beforehand.” The Intuit Analytics Cloud is already incorporating a big data lake in its analytics platform. More companies are recognizing their data as an asset in its own right that can be monetized for improved bottom lines. The Weather Channel is a prime example of this new trend. Realizing its data troves from more than 100,000 global weather stations were lucrative to a variety of businesses and industries, the company changed its business model — and its name to The Weather Company — to reflect its new operational mode. Analytics is reshaping the way business is conducted. These advanced technologies and trends give executives, Master of Science in Analytics graduate students and others working in big data the tools needed to make informed business decisions.